What does $1,600 rent you in Oakland, today? 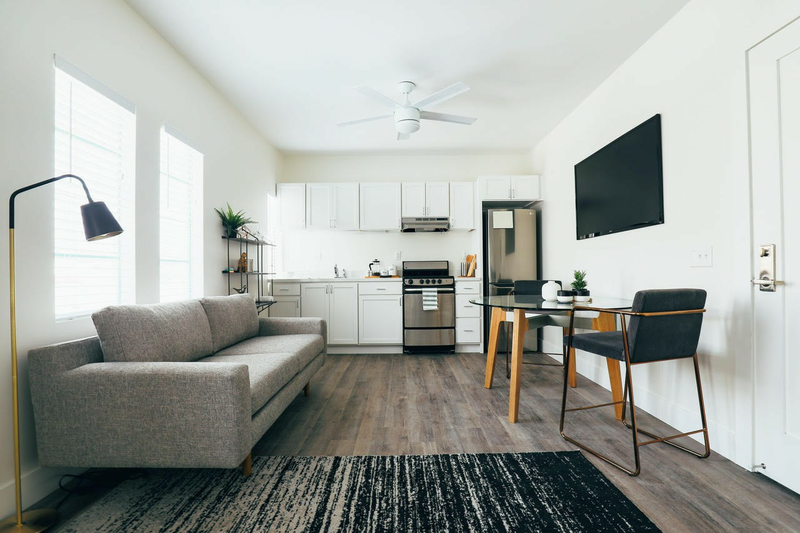 We've rounded up the latest rental offerings via rental site Zumper to get a sense of what to expect when it comes to locating an apartment in Oakland with a budget of $1,600/month. Listed at $1,600/month, this 750-square-foot one-bedroom, one-bathroom fourplex unit is located at 1476 79th Ave., #2. Inside, you'll find laminate flooring, granite countertops, stainless steel appliances and lots of natural light. For those with furry friends in tow, know that cats and dogs are permitted on this property. There's no leasing fee required for this rental. According to Walk Score, the surrounding area is somewhat walkable, has some bike infrastructure and offers many nearby public transportation options. Here's a studio apartment at 1638 47th Ave. that's going for $1,598/month. In the unit, you'll get hardwood floors, high ceilings with a ceiling fan, and a dishwasher. The building boasts on-site laundry, assigned parking, landscaped outdoor space and secure entry. Pet owners, cats and dogs are welcome on this property, too. Expect a broker's fee equal to one month's rent. Per Walk Score ratings, the surrounding area is very walkable, is very bikeable and has good transit options. Next, check out this 550-square-foot one-bedroom, one-bathroom apartment that's located at 2212 High St., #E. It's listed for $1,595/month. In the remodeled unit are tile floors, granite countertops and a ceiling fan. Off-street parking is available. Pet owners, inquire elsewhere: this spot doesn't allow cats or dogs. According to Walk Score's assessment, the surrounding area is very walkable, is fairly bikeable and has good transit options. Located at 10410 Foothill Blvd., here's a 750-square-foot one-bedroom, one-bathroom abode that's also listed for $1,595/month. There's assigned parking here, too, while the unit itself has a new gas range and lots of kitchen cabinets and counter space. Animals are not permitted. There isn't a leasing fee associated with this rental. Walk Score indicates that the area around this address is somewhat walkable, is fairly bikeable and has good transit options. Finally, and also listed at $1,595/month, is this 650-square-foot one-bedroom, one-bathroom apartment located at 2335 88th Ave. The unit has been updated with new linoleum and tile, new windows and new countertops. When it comes to building amenities, anticipate garage parking and secured entry. Cats and dogs are not welcome. Future tenants needn't worry about a leasing fee. Per Walk Score ratings, the area around this address is moderately walkable, is fairly bikeable and offers many nearby public transportation options.